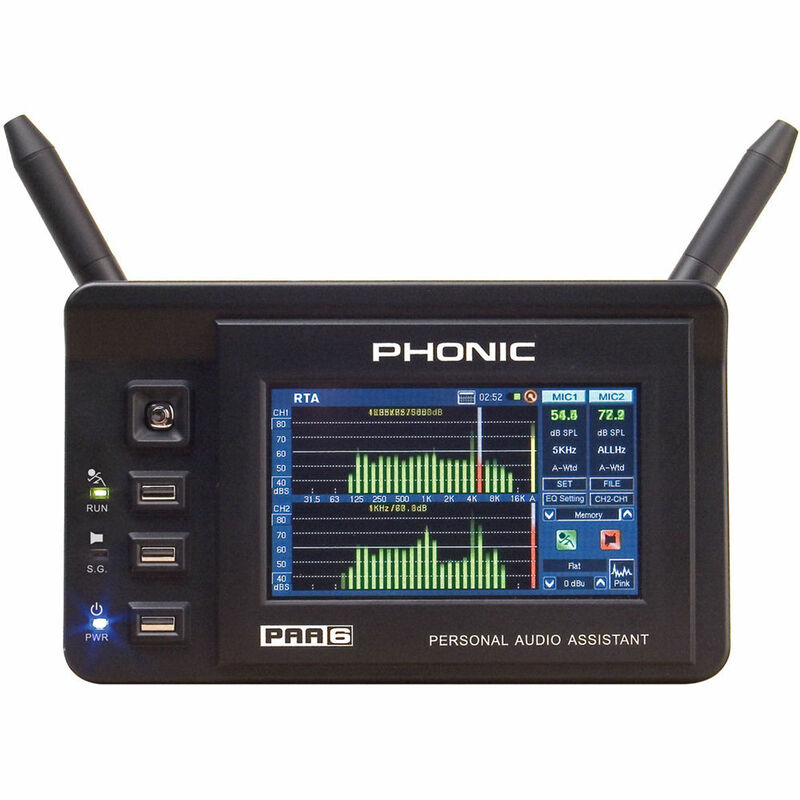 The PAA6 from Phonic is a 2-channel digital handheld audio analyzer that features a 480 x 272 color touch-screen display. The elegant graphical user interface allows all functions and menus to be easily accessed. Functions include a real time spectrum analyzer, RT60 measurement, tone generator, LEQ, EQ setting and phase checking. Also available are SLM, FFT, THD+N measurement, and scope functions. The 2 built-in condenser microphones take highly accurate measurements in any given situation. A USB connector and SD card slot have been included to assist in transferring information to and from a computer. This feature-rich, portable audio tester will satisfy the needs of professional audio engineers, regulatory enforcement agencies, and product development teams. Box Dimensions (LxWxH) 10.0 x 10.0 x 3.5"
PAA6 - Digital 2-Channel Audio Analyzer with Color Touch LCD is rated 4.0 out of 5 by 2. Rated 3 out of 5 by Anonymous from Good product, but no factory support This is a pretty good tool for portable use. When you want to use it with your computer, you can only use Windows 7. I tried every version going up to windows 10 and it simply doesn't work on those. Once you start using Windows 7, it is pretty reliable software and I like the fact that you can F1 at anytime for a screen shot that goes to your computer. Support from Phonic is non existent so don't expect any help from them. I previously used a PAA2 for testing and still do as there are some thing the PAA6 won't do that it does. Rated 5 out of 5 by Southern AV from This is it This is a piece of equipment that every professional audio tech/eng. needs.